Given this write up is being compiled in Westvleteren shortly before departing for a tour of Sint Bernadus and a catch up with Rodenbach's Rudi Ghequire at his son's brewery in Ieper, there can be little cause for complaint. 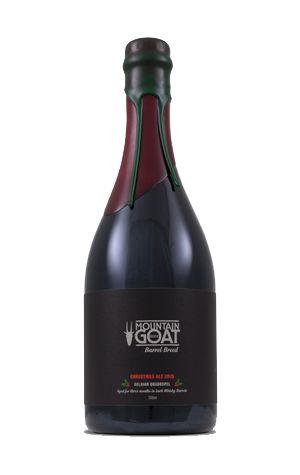 Yet being in the Northern Hemisphere does mean that the third Mountain Goat Barrel Breed release is tantalisingly out of reach. With the first two being the reigning Champion Australian Beer Barley Wine and the second a luscious Imperial Stout, this is a significance loss (to be ameliorated with a quick glance at the Belgium's trip's spoils, of course). So we need to rely on word from the brewery on this one, which again spent time inside the whisky barrels they obtained from Tasmania's Lark Distillery. They are words such as "seductive colour and flavour characters", "several litres of whisky still trapped up to an inch into the oak", "distinct vanilla/whisky sweetness to both the nose and palate" and "big, subtly sweet, spicy brew that will sit perfectly alongside your plum pudding on Christmas Day." The base beer is a Belgian quad, it's high in alcohol and they reckon it will age nicely for next Christmas too (if you can resist it).